A design for the failed Garden Bridge project, which lost taxpayers more than £40m. A charities' watchdog has concluded the failed Garden Bridge project represents "a failure for charity", which risks undermining public trust. Meanwhile, the head of the PRCA's charity group has slammed the project for becoming too close to politicians and public sector proponents, and a charity communications expert said the project highlights a failure of charity comms and transparency. 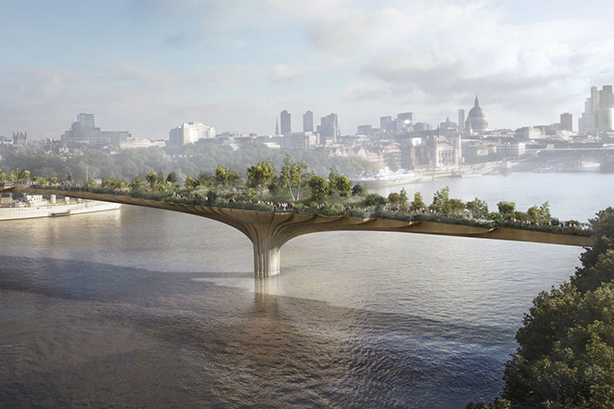 The proposal for a pedestrian bridge over the River Thames was eventually scrapped in August 2017 after the charity set up to build and manage the proposed bridge lost the support of London Mayor Sadiq Khan because of concerns about funding. The Charity Commission published its report on the Garden Bridge Trust last week, and set out wider lessons for charities, and those making public policy decisions that involve charities. The report acknowledges that more than £40m of public funds were spent by a charity without communicating a demonstrable public benefit, and is critical of the charity’s approach to transparency and accountability. However, it states that trustees of the charity fulfilled their legal duties in their decision-making and that the charity was not mismanaged. The report notes a number of lessons to be drawn from the case, including that trustees of charities that receive public funds to deliver public services or projects should demonstrate scrupulous accountability and a spirit of transparency and openness to the public. Simon Francis, chair of the PRCA Charity and Not for Profit group, said: "The Garden Bridge Trust fiasco is a warning to charities about the risks of getting too close to the public sector and to politicians. Charities should always maintain their independence and fulfil their charitable objectives over and above any political interference. It is the job of trustees and senior management to ensure this is the case on all occasions." Francis, who is also founder member of Campaign Collective, a social enterprise specialising in charity communications, added: "It's important that any possible failings in this case are fully investigated, not just to protect public funds, but also to ensure precedent is set and better practice understood for any future public-charity venture of this kind." Adeela Warley, CEO at Charity Comms, the professional body for charity sector communications added: "From a communications perspective we urge all charities to clearly communicate their charitable purpose and progress towards achieving their goals to ensure accountability and build trust." On Monday, 15 April, the Garden Bridge Working Group held a public meeting with Transport for London (TfL) to question its role in the project. A request was made to representatives of the Garden Bridge Trust to attend, but was declined. Tom Copley, London Assembly member and chair of the Garden Bridge Working Group, said: "The Garden Bridge Trust’s refusal to co-operate with the London Assembly is outrageous. Let’s remember that this is a body responsible for a failed project which lost the taxpayer £43 million. "Unfortunately, we cannot compel them to attend to account for their role in this as we can TfL, but there ought to be a moral obligation for them to account for their role given the level of public money involved. Their refusal to co-operate strengthens the case for a Parliamentary inquiry into this fiasco." Roland Rudd, founder and chairman of public relations firm Finsbury, was a trustee and the chair of Communications/Outreach Board. PRWeek contacted Rudd through his firm, but he declined to comment on behalf of himself or the Trust. However, a letter submitted to the Working Group by the Trust described their intention to tell the "full story" and outlined why they were unable to attend. A TfL spokesman said: "We continue to be open and transparent about our involvement in the Garden Bridge project and Andy Brown attended the London Assembly’s Garden Bridge Working Group meeting as part of this commitment."